As of July the 2nd, a pack of newly decorated Gromits will be returning to Bristol for Gromit Unleashed 2! Here at the Observatory, we were lucky enough to have a sneak peek at a few of the sculptures before they take up their posts alongside the landmarks of the city this summer. And we’re pleased to announce that the Clifton Observatory has been selected as one of those landmarks! The world-famous man and dog duo, Wallace and Gromit, were brought into being in Bristol, by Nick Park nearly 30 years ago. Alongside entertaining audiences of all ages in their on-screen adventures, the characters also lend their names and faces to two wonderful charities: Wallace & Gromit’s Children’s Charity, and the Wallace & Gromit Grand Appeal. The Wallace & Gromit Grand Appeal is their home-based project, raising money for the children’s hospital here in Bristol. Since it started in 1995, the Grand Appeal has raised over £50 million, which has been put to incredibly good use saving lives, and supporting sick children and their families. Out of the Grand Appeal, Gromit Unleashed was born. In 2013, 80 individually decorated sculptures of Gromit were placed around the city. After 10 weeks outside, and a grand exhibition where visitors could see them all at once, the Gromits were auctioned off. 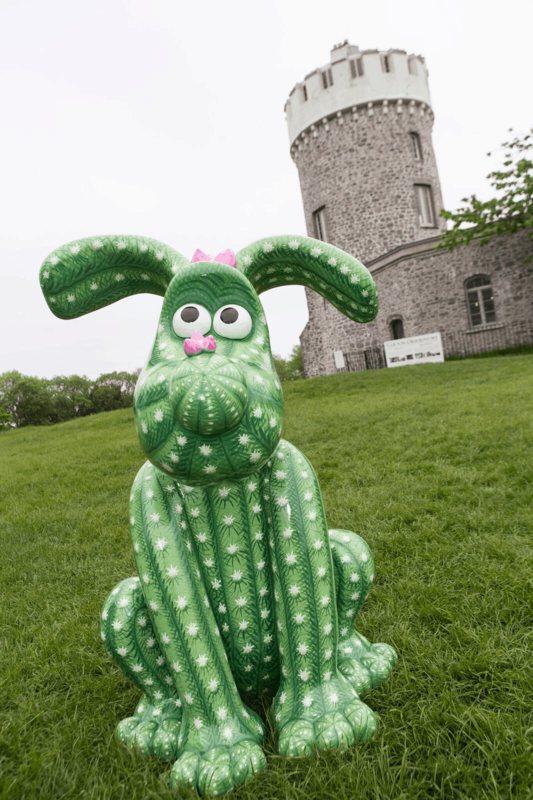 Gromit Unleashed raised an astounding £2.3 million for Bristol’s Children’s Hospital! After Gromit’s great success, a herd of Shaun the Sheep descended upon both Bristol (benefiting the local Grand Appeal) and London (for the national Wallace & Gromit’s Children’s Charity) in 2015, which many of you may remember seeing. Unlike previous years, this July we will be treated to a variety of characters – joining Gromit, will be his cheese-loving companion, Wallace, as well as his rival Feathers McGraw. Together they will make a total of more than 60 sculptures (and local sites) to discover and enjoy! We are very excited to see who sets up camp in between us and our friends at the Clifton Suspension Bridge this summer. If you’d like to include a visit to the Clifton Observatory in your Gromit trail this summer, we’re open every day of the week from 10am to 5pm. To buy advance tickets with a 5% discount, just click here. And don’t forget to tag us in your photos on twitter or facebook so we can share in the fun!